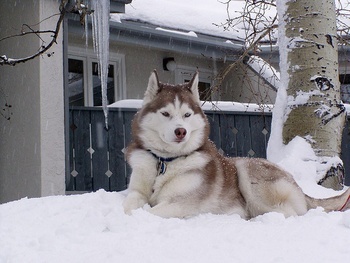 An iconic breed, the Siberian husky is often associated with Alaska, sled dogging and arctic temperature. Indeed, the husky dog is well suited to the arctic with an extremely thick double coat (said to be able to withstand temperatures as cold as -76 degrees Fahrenheit) and thick, fluffy sickle tail that aids in keeping it warm when at rest. It originated in northeastern Siberia (and was subsequently imported to Alaska), and was bred by the Chukchi people of northeast Asia. With their medium to large, well-muscled frame, the dogs have been used by indigenous people, explorers, miners and homesteaders to settle the coldest regions on the planet. A member of the spitz group, the husky is just one of many sled-type dogs, which includes the Samoyed, Alaskan malamute, Alaskan husky and the Japanese Sakhalin husky, to name just a few. Members of the family all share the weather-resistant coat, as well as powerful and athletic bodies and high-energy levels. They were first used by the Inuit to pull sleds full of supplies and people, therefore aiding in the settling and inland exploration of Alaska, Canada and other places. European explorers then began using dog teams to pull sleds in their exploration of North America – and even Antarctica. Smaller and faster than many of the freighting dogs in use during the early 1900s, Siberian huskies quickly came to dominate the racing scene in Alaska and were used to quickly deliver goods to remote outposts. The 1925 serum run to Nome, Alaska, for which the Iditarod race commemorates, is a perfect example, and an event which also helped spawn the Siberian husky’s popularity. While thick, well-furred coats are a hallmark of the breed, all colors, from white to black, and markings are acceptable. Siberian huskies should stand no more than 23-½ inches tall and max out at 60 pounds, with females being smaller than males. Interestingly, their eyes can be from pale to dark blue, amber or brown – or even a combination of these colors! Along with its endurance and athletic ability, the Siberian husky has an agreeable and outgoing personality. With proper training they make great family dogs, however, because they’re descended from working dogs, they require a lot of exercise. If you can’t provide ample time for the dog to run, it will likely be excitable and hyper, especially indoors, and could have a tendency to try to escape and roams. Household that enjoy an active lifestyle, including running, hiking and snow skiing, would be ideal. Their dense coat requires grooming, especially in the spring before warm summer weather hits. The Siberian husky enjoys a lifespan that averages 12 to 14 years and is one of the few medium- to large-sized dogs that doesn’t suffer from hip dysplasia. However, they can be affected by gastric issues like bloat, bronchial problems and eye issues (ranging from juvenile cataracts to progressive retinal atrophy). At Paw Print Genetics, we can test a Siberian husky for degenerative myelopathy – a neurologic disorder that affects the white matter tissue of the spinal cord and is considered the canine equivalent to amyotrophic lateral sclerosis (Lou Gehrig’s Disease) found in humans. Are Dalmatians the only breed to develop urate bladder stones?